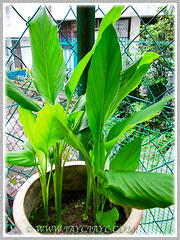 A regular consumer of Turmeric, we have been planting these plants for about a decade in pots at our backyard, that we named ‘our vegetable or kitchen garden’. It’s so easy to plant them. 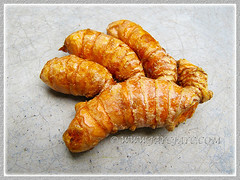 Just buy fresh and healthy-looking Turmeric rhizomes from the supermarkets or grocery stores. Fill your pot with garden soil, break the fingers and push them into the soil. Water moderately and regularly, and young plants will emerge in no time at all. Over several months later, when the plants are matured, you can harvest the rhizomes fresh and use them for cooking your curries or marinate your fish, prawns and meat. Even the leaves can be used to wrap them before frying for a flavourful and distinctive taste. We can’t do without Turmeric, the amazing spice and remarkable medicinal plant. 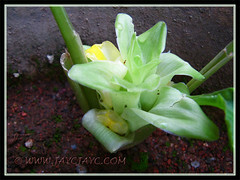 Common Name: Turmeric, Common Turmeric, Indian Saffron, Curcuma. 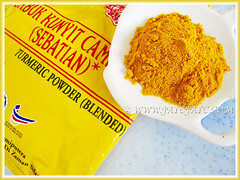 Etymology: The genus Curcuma is derived from the Arabic name, kurkum which means saffron or turmeric. The common name, Turmeric is derived from the Latin word, terra merit (meritorious earth), referring to the colour of ground turmeric. Origin: Native to southwest India. Cultivated widely throughout tropical Asia where it is popularly used as an aromatic spice and medicine, dating back nearly 4000 years ago. Plant type: A tropical rhizomatous herbaceous perennial. 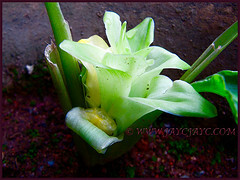 Features: Curcuma longa is a popular species belonging to the genus Curcuma that consists of about 100 accepted species. It is a fast-growing, herbaceous perennial that can reach up to 1 m in height. 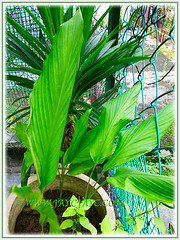 The smooth and simple leaves are held on 20-45 cm long petiole that may measure between 50-115 cm long in larger plants. Leaf blades are medium green in colour, oblong or elliptic (30-45 x 15-18 cm or more) and tapered at each end. The leaves are alternate and arranged in two rows. From the leaf sheaths, a false stem is formed. Beneath the foliage, it produces aromatic underground rhizomes that are tuberous and have rough yellowish brown skins covering a deep orange flesh inside. The main rhizome measures 2.5-7 cm long and 2.5 cm in diameter, with smaller tubers branching off. 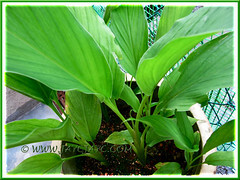 The Turmeric plant does produce a 12-20 cm long inflorescence containing many flowers at terminal end of the false stem. 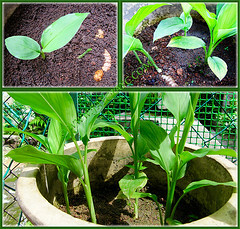 Culture (Care): Curcuma longa or Turmeric grows easily in the tropics. It needs temperatures between 20°C and 30°C and a considerable amount of annual rainfall to thrive. Needless to say, it can be grown in sub-tropical and temperate regions with the right care. Light: Best in filtered sunlight or semi-shade. Morning sunlight and midday shade is ideal too. Moisture: Moderate water needs. Water regularly for optimum growth but avoid watering overhead. Soil: Grow in organic-enriched and well-draining soils. If you lack garden space, grow them in containers with good quality potting soil. Others: Lack of water or drought, and too much sun will cause the leaves to hang limp and develop burnt tips. Remove old blooms after flowering to keep it aesthetically pleasing and to encourage new growth. Feed once monthly and lightly with a balanced organic fertiliser, one that provides healthy growth and flower production. Generally free from serious garden pests and diseases. However, do watch out for spider mites, mealy bugs, slugs and snails. We’re really fortunate that our plants never encountered these pests. For subtropical and temperate regions: Hardiness: USDA Zone 10-12, although in zone 9, Curcuma longa may come back if properly mulched during the colder months. Being a tender perennial in temperate regions, a better alternative will be to grow plants as annuals in containers and overwinter indoors when needed. Plant the rhizomes in early spring once all danger of frost has passed or start them in a container indoors. Feed your plants once monthly with a liquid, water-soluble fertilizer to encourage optimum growth. Usage: Curcuma longa or Turmeric, whether fresh or in powder form is used extensively in cooking, especially as an aromatic spice in Indian, Bangladeshi, Pakistani and Middle Eastern cuisines and curries, as well as to add a golden colour to boiled white rice. It is used in religious ceremonies in Southeast Asia. Being coloured golden-yellow, the Turmeric is added to mustard, butter and cheese to complement their colours, plus used for dyeing fabric. The fresh Turmeric leaves are used to wrap and cook food to provide a distinctive taste and also flavourful when added to curries such as Beef Rendang and Portuguese Devil’s Curry. Besides growing these ornamental plants on the ground to beautify your garden, they are suitable for container planting too. Also, the usage of Turmeric is well-known in traditional and modern medicine. Check out the NCBI link given below to know more.